Head and face: Acute diffuse sinusitis and cellulitis with catarrhal and suppurative rhinitis and conjunctivitis. Edema of the subcutaneous tissue, as shown here, can be quite severe and involve the periorbital region and infraorbital sinuses. Edema may also extend into the intermandibular space. Nasal discharge may range from serous to mucoid or purulent (as shown here). 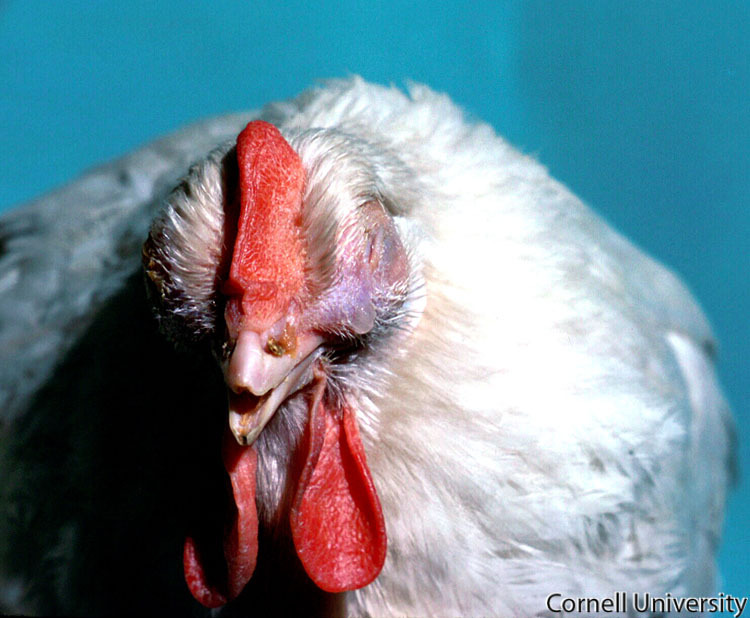 Infected birds typically have reduced feed consumption and growth and a drop in egg production. The subcutaneous tissues of the head are swollen and there is a thick discharge from the nose. A small amount of clear discharge is present in the eye. Additionally, the area over the infraorbital sinus is swollen.